Two astronauts test the SAFER system during a shared spacewalk on Sept. 16, 1994. In this historical photo from the U.S. space agency, Astronauts Carl J. Meade and Mark C. Lee (red stripe on suit) test the Simplified Aid for EVA Rescue (SAFER) system some 130 nautical miles from Earth. The pair were actually performing an in-space rehearsal or demonstration of a contingency rescue using the never- before flown hardware. 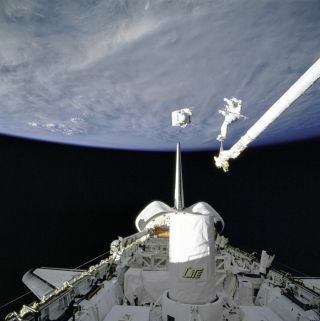 Meade, who here wears the small back-pack unit with its complementary chest-mounted control unit, and Lee, anchored to Discovery's Remote Manipulator System (RMS) robot arm, took turns using the SAFER hardware during their shared space walk of September 16, 1994.